A few evenings ago, I was driving by J.C's. and Samantha's beach cottage, a fierce tropical sunset illuminating the waves to my left, my mind far away, when I caught the image for a millisecond: their chocolate Labrador, Chester, bounding over the white gate meant to hold him in the cottage; Samantha standing on the porch, laughing and holding Lily, their first child and my first god-child, in a comfortable hug; J.C. walking towards his Jeep, a surfboard balanced on his head, his eyes on the waves, a smile on his face. I burned that image permanently in my mind. I turned sixty this year. (Is that really possible?) Already many people I love are gone, and I know that life can be really good and really bad. I also imagine it's a wintry day in the beltway. But it is a fine, blue-skied day in Tortola here in the British Virgin Islands, my home. In many ways, life here is just as exotic and idyllic as envious friends imagine. A crossed-eyed goat down the ocean-side hill in my village has cursed me, so a sweet local church leader swears. A yacht—unfortunately not mine—about the size of the D.C. budget deficit is anchored off my house. And I'm headed to a meeting about one of our island's hottest issue: free range cows, goats, chickens and donkeys. They roam free here a lot, blocking tiny roads and entrances to businesses, occasionally unnerving tourists, appearing at the most unexpected places. I came home one day to find a goat in my living room, munching on a paperback. Some folks want to pen the livestock up permanently. I'm for animal freedom. My commutes on this 3 by 12-mile island—partially because of the animals but mainly because of the precipitous, corkscrews roads and astonishing vistas—is virtually always pleasantly paced. The people here, called "belongers," are the same. But "life in paradise" is still real life. My water cistern has sprung a leak. A new nest of termites (they eat concrete here) swarmed around my cliff-side picnic deck this morning. A crack has appeared in a wall of my home. Wall cracks really jangle the nerves when your home hangs nine stories over the ocean. I’m also days late in preparing a court-ordered report, eighty emails behind, overbooked on company, and just as I was closing down my computer this morning, the island lost power (for the third time today). In the midst of all this, I accidentally erased the only image I have of a lifelong friend who is terribly ill. Wherever we are, life is promising and troubling and packed. But right now, you're not going to worry about that, you're going to do something astounding. Here's the plan: First, read this article. Then head to our cookie-free, advertising-free web site. Then get up and take a fifteen minute walk, wherever you are. That piddling effort—a walk—is going to turn you into an international athlete! 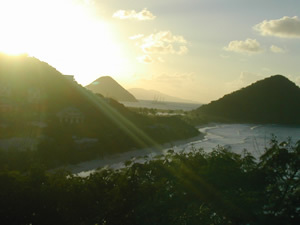 It can bring you to Little Apple Bay, my tiny village in Tortola in December of 2002! And (though it may sound corny or unbelievable) that little walk is going to lead you to a more promising life, notch-up your self-esteem, improve your physical and mental health, and maybe even turn you into a hunk or hunkess. But sixteen years ago I did make simple changes in my mental and physical habits that have made these sixteen years on average good ones for me mentally and physically. What I have learned has gotten me through the death of my parents, business problems, health problems, and the death of my only nephew from a drug overdose. Though I still prefer indolence to serious exercise, I have continued some type of exercise regimen for all sixteen years. I am a relatively healthy man. Though I probably still party more than I should, I'm not too worried about that. Though I'm a bit overweight again, I'm not overly bothered by that, either. I know, now, how to maintain some equilibrium or at least a shaky truce with life's demons. And, more to the point, I'm finding that some of my best friends here in Tortola—all young enough to be my kids—are a bit worried about their bodies and health, too. In one year, J.C. Pierce, 35, has gone from a carefree surfer to a man with a wife, a dog, a new baby, an expanding waist line, and a receding hair line. Patty Ann Mittelholzer, 32, is a single mother from Guyana. She's been fighting a weight problem for years. Patty Ann works at my favorite hangout, The Jolly Roger restaurant and bar and lace of general mischief. Lexi Hurst, a 22 year-old raised in Barbados, isn't happy with his current physical state or his career path. Lexi's a self-proclaimed loner. Justin Wilson, 23, a jock by any standards, and just months out of Cornell, with a degree in hotel management, says he also graduated with , "a Heineken belly." In truth, I don't know many of us who aren't worried either about our looks, or health or lack of time. Which brings us back to that fifteen minute walk and your December trip to the British Virgin Islands: Patty Anne and J.C. and Lexy and Justin and I have decided to shape up a bit, and we want you to join us. Our web site has a choice of training calendars which introduce (or reintroduce you) to the joys and terrors of exercise, starting with that walk. The calendars let you chose one, two, three or more activities as weapons in your personal attack on lethargy. Starting with a simple walk, the calendars get your body ready for amazing feats. Like biking, hiking, swimming and/or kayaking this December over the hill in magnificent Long Bay! Our web site shows plenty of enticing pictures of the scene of the crime, as they say. During the past 16 years, thousands of Beltway folks have trained on our calendars, and a couple of thousand have actually participated in our events You can read some of their success stories on our web site and see pictures from past Conchathons (what we call our events) in the Bahamas, Key West, Washington, and the British Virgin Islands. Go to our web site, www.walkwithremar.com, and choose your poison, er, training calendar. And be courageous! If you're not a swimmer, train for the one mile swim! Do you just want to walk? We'll get you ready for a hike up the most beautiful and steep road in the Caribbean! Ditto for biking. If you've never kayaked, train for kayaking! Sign up on-line and become part of our training support group. Why not find a buddy to sign up with you, too? Our events happily accept three-person teams where each team member tackles a different leg of each event. Browse through our web site. You'll find lots of pictures of our previous athletic extravaganzas. You'll find the weekly journal of Patty Anne, Lexy, J.C., and me. And you’ll find lots of no-nonsense health information. Follow my articles on this page every week or so. Hey, you deserve this! At the very least, you have instant bragging rights ("Oh, I'm training for an international triathlon"), and at the most, you'll change your life. Head to www.walkwithremar.com right now.